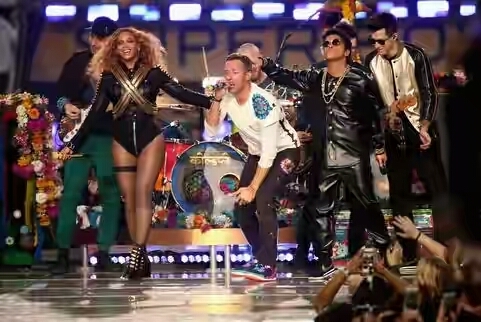 I don’t follow football, but I watch the Super Bowl because I have crippling pop culture FOMO. So, even though this was a landmark year for the championship (the 50th anniversary or whatever), the only reason I didn’t fall asleep before halftime was my dire need to witness Beyonce’s return to the Super Bowl stage. Because she’s an alien we never deserved but were gifted with anyway, Bey did not disappoint. (Frankly, she rendered the rest of this cultural spectacle irrelevant, but I’m trying not to be biased.) After graciously letting Coldplay and Bruno Mars open for her, she milly rocked with an army of female dancers and expertly played off an almost-fall. BUT! Did you catch her tribute to Michael Jackson? 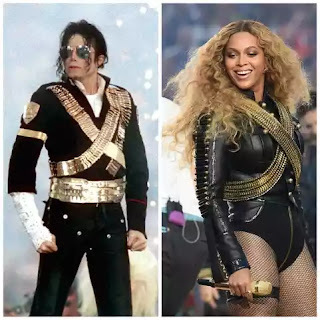 Since this was a big birthday for the big game, this particular halftime show featured a video montage of throwbacks to past major performances (well, save one notable but understandable omission), but Bey gave her own specific tribute to Michael Jackson’s Super Bowl XXVII halftime performance: She modeled her costume after the King of Pop’s own iconic look.